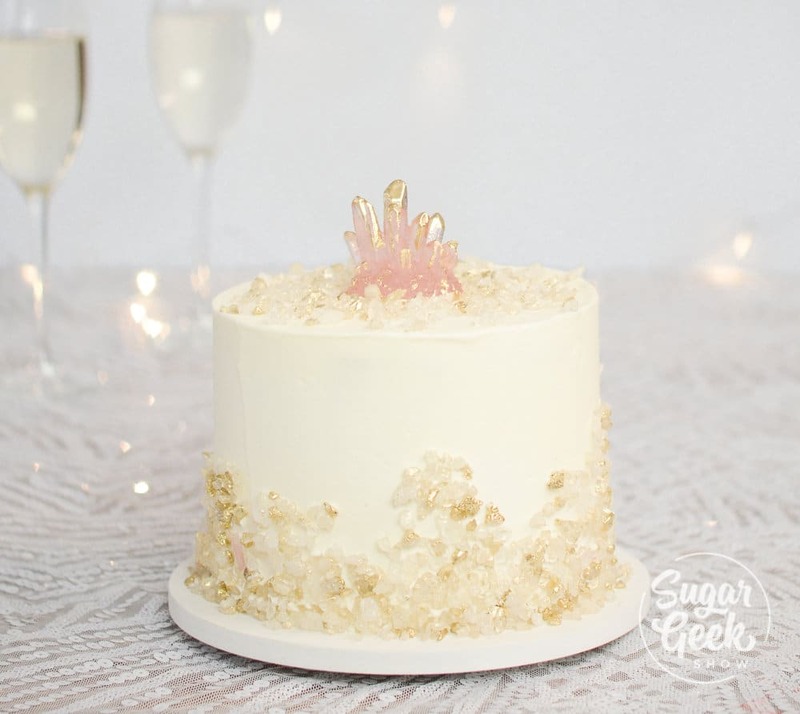 Pink champagne cake that is light and fluffy with a touch of sweetness from real champagne! Pink champagne cake is a great cake to use for any celebration. There is just something about those pink layers of cake that scream celebration! I made this pink champagne cake for New Years Eve but it’s really a great flavor of cake for any time. Paired with my easy buttercream frosting, it’s sure to please anyone! What does pink champagne cake taste like? Well, funny you should ask. 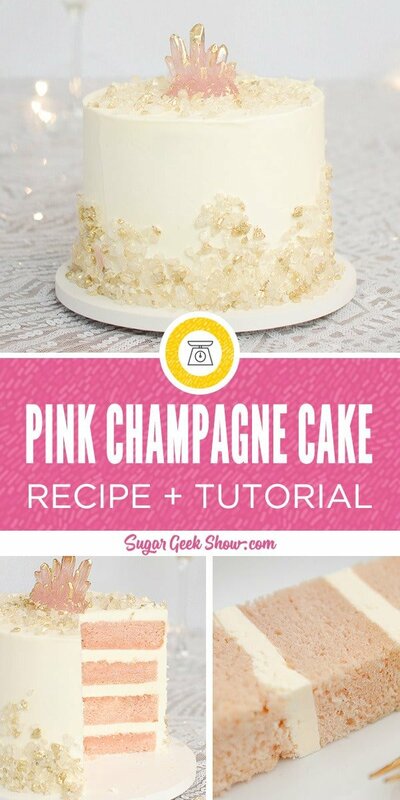 Pink champagne cake tastes like… Champagne! While to many it doesn’t taste exactly like picking up and drinking a glass of fancy champagne, it does have a distinct taste that has a notes of sweet vanilla flavor with a bit of tangy-ness mixed in. What filling should I use with a pink champagne cake? 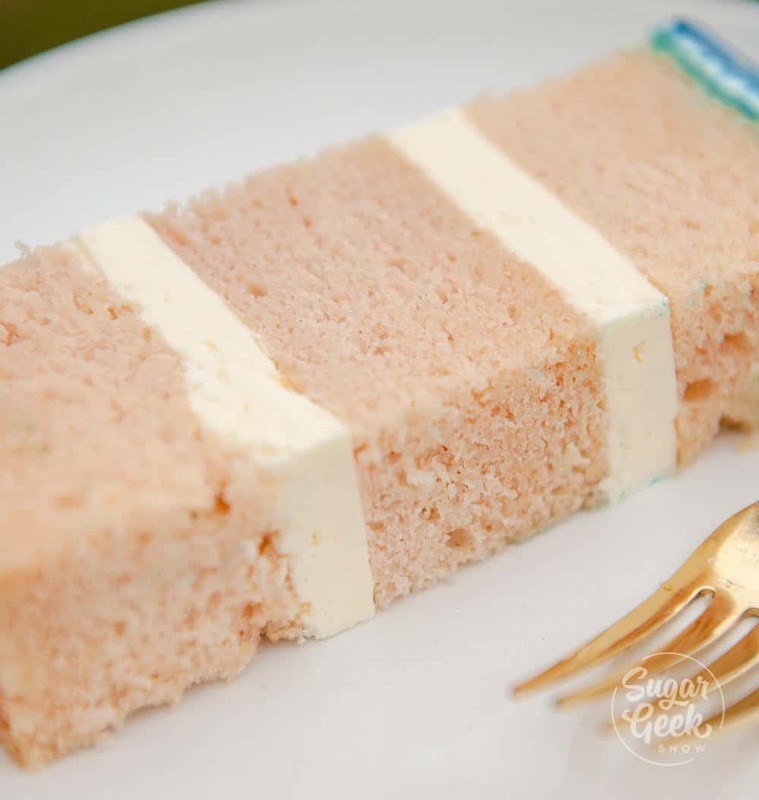 Pink champagne cake is pretty versatile as far as fillings go but it does traditionally pair best with fruit fillings and a light buttercream like my easy buttercream frosting. It also pairs well with strawberry and white chocolate buttercream. Does a pink champagne cake have alcohol in it? Without getting into the science of it all, the answer is yes. When you are baking 6″ or 8″ layers, the cake will retain about 10% of the alcohol content. 10″ cakes or larger the alcohol will bake out. If you are concerned about having any alcohol remain in your cake, you can use a pink champagne flavoring instead of real pink champagne. 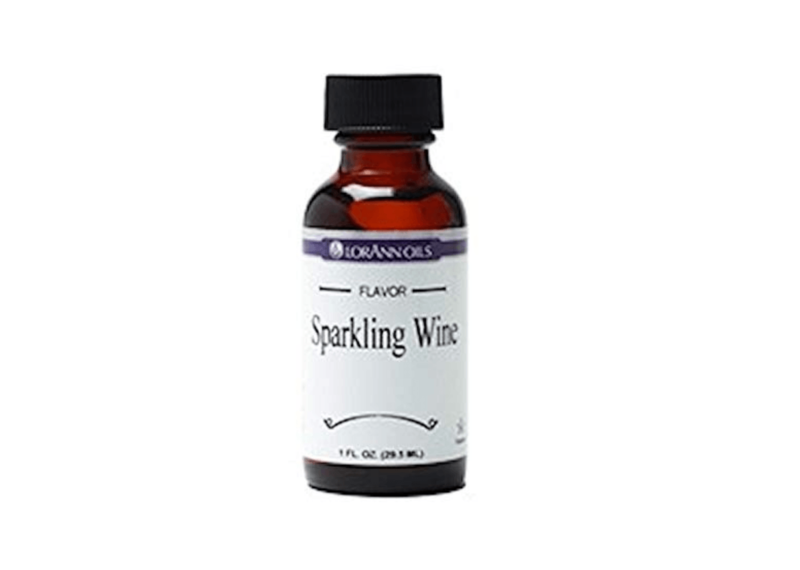 I use Lorann Oils Sparkling Wine Flavoring. Pink champagne cake is no new recipe but finding a good one can be challenging. 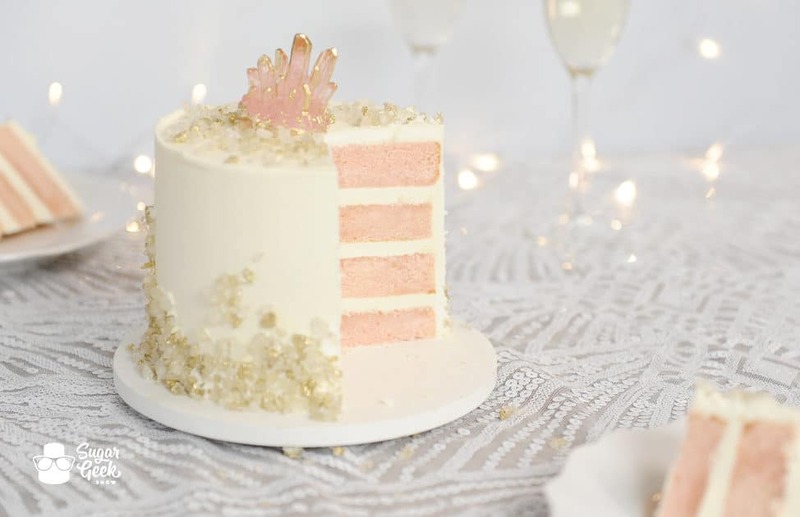 First of all, have you ever had a pink champagne cake that actually tasted like champagne? Probably not. 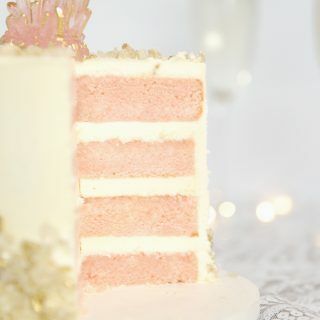 I have been tweaking my old pink champagne cake recipe for the last few months in anticipation for a big New Years Eve party and I don’t wanna brag (ok I’m gonna brag a little) but this is the most DELICIOUS and moist pink champagne cake ever and is packed full of real champagne flavor! Talk about a “OH DUH” moment! 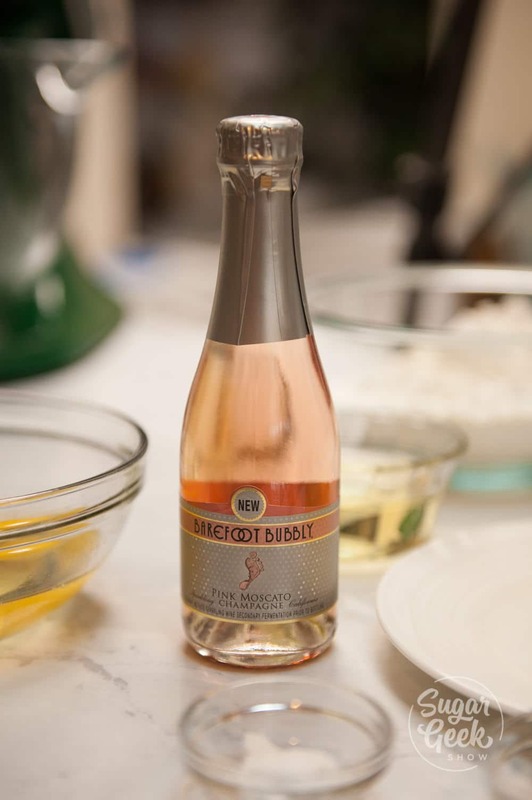 When you bake with straight champagne, all the flavor bakes out along with the alcohol so this bit of flavoring is key to that special taste! Best part is that the oil is not too expensive and you only need a few drops. If you plan on making lots of champagne cake though I would recommend going ahead and buying the big bottle. Of course you can decorate your champagne cake any way you like but this is how I decorated mine! First I combine about a tsp of Truly Mad Plastics super gold with 1/4 tsp of everclear (or you can use vodka or lemon extract). It should resemble paint consistency. I put a couple of drops of the gold into a bowl of rock candy so they are sort of roughly coated. Pick up the cake in your left hand and scoop up handfuls of the rock candy with your right and press it onto the sides of your cake all around the bottom edge, let the excess fall back into the bowl. Next I color some clear simicakes isomalt a light pink by melting it down and adding one tiny dab of electric pink food color with a toothpick. Pour the melted isomalt into a medium crystal mold and let cool completely. You can put it in the fridge to make this go faster. Once the mold feels cold, it’s safe to take out your candy crystal. Once the crystal is set, I painted the edges with some more gold. Place the crystal on top of your cake and sprinkle on some more rock candy! All done! Ps, I think that the best buttercream to pair with this cake is the white chocolate buttercream recipe and some fresh strawberries! When you need a special cake for a special occasion, nothing says party like pink champagne. Combine this delicious cake with fresh strawberries and white chocolate buttercream for the ultimate dessert. Once your sugar is ready, add in your eggs ONE AT A TIME. Letting mixture mix for one full minute after each egg is added before adding the next egg. Add in 1/3 of your flour to your butter/egg mixture and once combined, add in 1/2 of your liquid, then flour, then liquid, then flour. Let mix just until everything is combined. Divide into two 8" round pans. Bake for 25-30 mins until a toothpick comes out clean. Can I use this recipe for cupcakes instead of a cake? Hello 🙂 beautiful cake! quick question though….what is she pouring on the cake before frosting? I’ve made this cake 3 times more and it’s perfect everytime. Personal preference: I added two teaspoons of the appalling candy flavor and used actual pushing champagne in the recipe. Perfection!! Auto-correct!! Not appalling!! Sparkling wine candy flavour. Anything but apalling!! Omg. hahaha I wasn’t judging lol 😀 Glad you liked the recipe! I’ve made this recipe three times, and it’s turned out perfectly each time. The only change, and it’s just personal preference, is I used pink champagne, and two teaspoons of the sparkling wine candy flavour instead of one. Perfection! Hello I was wondering what was sparkling wine candy flavor? Hi!! The link in the description is working? Where can I purchase the flavoring from? Also, is there a close second you recommend? I made a test batch and it was amazing! If you want to assemble a 4 layer cake. The 8″ for example, do you do a double batch or do the 2 8″ round cakes bake high enough to be layered into 2 each making 4 layers…. Thanks! Hi, I don’t see when to add in the backing soda in your recipe. I assume it is sifted in with all the other dry ingredients but I just want to be sure! Where can I purchase that bottle you used for simple syrup? Hi, I was wondering if I could substitute root beer extract or root beer oil candy flavoring for the champagne extract and root beer for the champagne? I love your cakes the white velvet is my new go to for any white cake. My husband wants a root beer cake for his birthday and I am not sure how to create it. Hi going to make this cake for my freinds 50th birthday! Looks great and easy to follow but what is AP flour? Hi! A few questions on your process; For the pink isomalt crystal, how did you dye it pink? And if coloring was used, when/how was it incorporated? Can the chamgane flavor be added to it as well? Also, what is the difference between isomalt and regular rock candy? What would happen if I attempted to melt down rock candy to make the crystal topper instead of using isomalt? And vice versa, if I just crushed isomalt to use on the sides of the cake instead of rock candy. Thankyou! I have never tried to melt down rock candy so I am not sure what would happen but it’s not the same thing as isomalt. Isomalt is a sugar substitute used in sugar free candies. It’s more clear than straight melted sugar and less prone to humidity. You can use crushed isomalt on a cake but keep in mind that crushed sugar can be very sharp and can potentially cut the mouth. Couple of questions if I may. 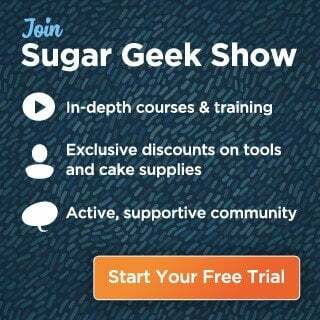 What is AP flour in the UK? On a site I’m on there’s a bit of controversy with some saying it’s cake flour others plain flour?! Also can you leave out the extract or replace for something else? Where can we find your white chocolate buttercream recipe? Hello! Thank you for sharing this! How long does the cake last? Does it hold up well under sugarpaste in a tiered cake? Thank you! What do you mean how long does it last? A cake should be eaten as soon as possible for freshness. Each day you don’t eat it, it will taste more dry and stale. I typically will bake a cake one day, frost it the next and deliver on the third day. Yes you can cover it in fondant just like any other butter cake, just chill before handling. Hi, thank you for sharing this recipe. May I know what can be used as the alternative to pink champagne pls as I can’t take alcohol. I made this cake yesterday and iced it today after chilling. The flavor is great, but the cake came out kind of dense. Any recommendations or fixes for that? I do feel like the cake is a bit denser than my vanilla cake recipe if the champagne is not warm enough. I actually will nuke it for about 10 seconds to make sure it’s the same temp as everything else. Are the liquids measured by weight or by volume? Filling you stated is white chocolate buttercream and strawberries. I’m assuming a layer of buttercream and sliced strawberries on top? Then repeat for each layer? Good day! May I ask if I can use this cake for carving? Thanks. I made this cake – 4 tiers – for an engagement party, and it was absolutely the best cake I have ever made. The texture was sturdy – I never had to worry about it crumbling – and it was beautiful on the inside. I filled it with buttercream and sliced strawberries soaked in champagne. It was the talk of the party! Thank you for a genius recipe! Yay! I’m so glad you enjoyed the champagne cake recipe! could you soak the cake with more pink champagne instead of simple syrup to make the cake more moist?